Ginsu Knife mastermind Barry Becher passed away in late June of 2012. You may not recognize his name – unless you’re a truly serious marketer – but I guarantee you’ll recognize his product. Back in the late 70s, he and his partner Ed Valenti started a business in a garage and took an Ohio-manufactured kitchen knife that was selling in supermarkets for a buck and transformed it into the Ginsu Knife. Using short form TV spots they sold half of billion dollars worth of these knives…one $10 to $20 order at a time…before the Internet…before 800 numbers were trusted…and before consumer credit cards were commonplace. Strangely enough, there have been only two groups of marketers lucky enough to get the inside story straight from the source on how they pulled off this spectacular feat of selling: students at Harvard University and…members of the The System Club. I debated with myself about cracking the System Club Archive to let this one out. I’ve shared System Seminar stuff before, but never in ten years have I ever shared System Club material outside the Club – but damn it, everyone in marketing should know this man’s name and the astonishing things he and his partner accomplished. 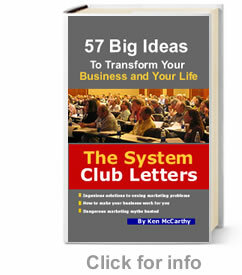 System Club members have had access to this interview for the past six years. Now it’s yours too. Too good not to share. P.S. This interview and over 100 more like it can be found in the archive of the Members-Only System Club. Frankly I’m surprised a serious marketer like you hasn’t joined yet.